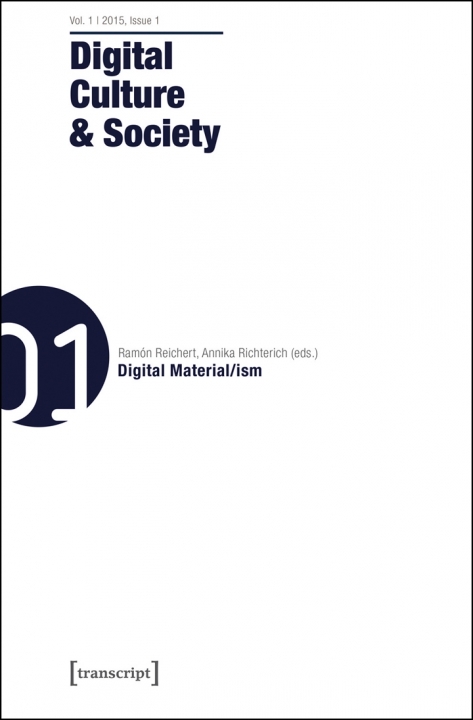 The inaugural issue of Digital Culture & Society on “Digital Material/ism” has just been published (October 2015): It presents case studies as well as methodological reflections and theoretical insights into digital materiality and materialis m. The issue contains articles by Tim Barker and Conor McKeown, Till A. Heilmann, Stefan Werning, Laura Forlano, Grant Bollmer, Ashley Scarlett, Yuk Hui, Moritz Hiller, Evelyn Wan and Sabrina Sauer. Moreover, for the first issue I have interviewed media theorist Jussi Parikka about his book “A Geology of Media” (2015), the relevance of new materialism and the need for critical, digital humanities. My Maastricht University colleague Karin Wenz spoke to sociologist Tim Jordan about his book “Information Politics” (2015), reflecting on issues of power, control and politics in digital culture. Digital Culture & Society is a refereed, international journal, fostering discussion about the ways in which digital technologies, platforms and applications reconfigure daily lives and practices. It invites reflection on how culture unfolds through the use of digital technology, and how it conversely influences the development of digital technology itself. The journal is edited by Pablo Abend, Mathias Fuchs, Ramon Reichert, Annika Richterich and Karin Wenz.